I have been fortunate to work with various Miss Ireland’s over the years. It is always great working with such beautiful, elegant and hard working women. Sacha is no different. The Hillsborough beauty worked her way up from the Miss Antrim title to the goal of Miss Ireland. She is currently with CMPR so is no stranger to the fashion world and presenting herself well. Unfortunately success wasn’t to be had at the Miss World event, but she was a great ambassador for Ireland. We had a great day shooting in studio, with a nice early start for Sacha for her drive down. We were aiming for a easygoing test shoot, natural makeup, nothing major. Sacha looked after her own hair and makeup for the shoot and what a great job she done. We shoot on my usual white background and we also tried out my new black corner set. It is a still work in progress and there is lots of testing to do with it to see what kind of light can be achieved with it, but so far so good. The bodysuit look against the white wall was the more striking of the looks. It showed off Sacha’s 5’9 figure perfectly. The shots were featured in the Irish Sun in March 20th. Screenshot shown below also. As you can tell, I have not been posting as much behind the scenes posts as much anymore, that is purely a time issue. Social Media is the best way to see what I get up to on a shoot. Click on the links on the top right. Also, if you have any questions on anything, post them in the comments below. Say Hey! to Jess Hayes Miss Ireland 2014. The cork gal dropped down to my studio for a test shoot to update here book a little. As you can see from the pictures, Jess is stunning… and tall! She stands 5’11. She has recently just signed with Andrea Roche Model Agency, so expect to be seeing her out and about fairly regularly. Jess is the 5th Miss Ireland that I have shot now. You can see all my other shoots with Former Miss Ireland’s and finalists here: https://www.richie.ie/tag/miss-ireland/ . Keep an eye on my Instagram or my FaceBook Page to see my next shoot with Jess before she jets off to Miss World in November 2014. Tipperary Teacher, Aoife Walsh was crowned Miss Ireland for 2013. She was a very deserving winner too in my eyes and one of my favourite Miss Ireland’s to shoot. Her fantastic red hair adds to the quintessential Irish’ness about her and would do her proud on the Miss World stage. Unfortunately that didn’t work out for her, but she still had a great year as Miss Ireland and has plenty of modeling work here to keep her going. It was great to get her down in studio for a shoot. We had done the usual Twitter and Facebook chats about doing a shoot and it eventually came together. A lot of time when trying to organise a shoot with people online, the interest can fizzle out. But not this time. We had a great team on board for the shoot. Fellow Wexfordian Laura Mullett (http://www.lauramullett.com/) styled the shoot. I have worked with Laura before and she always brings fantastic style to shoot. Sophie Wong was at hand for fantastic Makeup for Aoife as well as Hair Styling. Sophie is also Wexford based, so it was a nice local team in studio. Sinead Noonan, Miss Ireland 2008 in Studio for a quick test shoot. 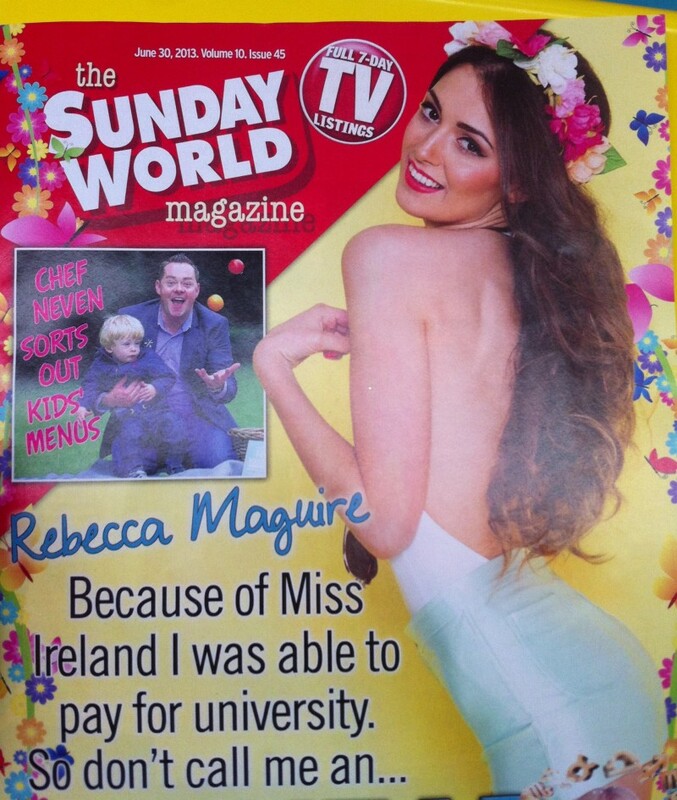 Rebecca Maguire is the stunning Belfast girl who won the Miss Ireland 2012 title. I first worked with Rebecca when she won the Miss Wright Venue in 2012, and from there she went on to win Miss Ireland. We shot this in June as her reign was coming to an end. We were shooting for the double page feature in the Irish Sun and for the cover of the Sunday World Magazine. We assembled a great team for the shoot. Rebecca came down to my studio from Belfast for the shoot. Aimee came from Dublin for make-up. Edel drove down from Baltinglass. Laura popped out from Enniscorthy and Jason joined us also to video the shoot. The team worked great together and we got some fantastic images. This was my first time working with hair stylist Edel Jones. Edel works in Tecknicolour saloon in Baltinglass. Edel done fantastic job with Rebecca. My favourite hair look from the day with the one above… there is a hint of a Cheryl Cole look going on I think. Combined with the fabulous dress, it is a very hot look. Rebecca really rocked it this look, which you can see in the video below. Below is a behind the scenes video shots by my assistant and DE Photo Staff member Jason Ennis. I kind of throw him into the deep end on this one as it was a last minute thought. Jason shot it on one of my Canon 1D mkIV bodies. I later edited the footage together and below is the result.